Fiber art has become a widely celebrated art medium, one that is ever evolving and crosses the boundaries between fine art and craft. The scope of this medium is exemplified by the artworks displayed in, Fiberart International 2019 (FI2019), the 23rd exhibition of contemporary textile art sponsored by the Fiberarts Guild of Pittsburgh, Inc. FI2019 will feature artworks by 55 artists from the US and abroad. The exhibition will be hosted by two respected Pittsburgh arts organizations: Contemporary Craft and the Brew House Association. Opening receptions and awards ceremonies take place at both locations on Friday, May 31, 2019 from 5:30-8:30 p.m. The exhibition is free and open to the public, and will be on view through August 24, 2019. Fiberart International 2019 records the changing definition of textile art and gives the audience a chance to experience works by a diverse group of artists. Internationally respected artists and exhibition jurors, Sonya Clark and Jane Sauer reviewed more than 1,400 art works submitted by artists from 28 countries and across the United States. They refined the selection to 56 pieces bringing together artists from eight countries and 23 states. On Saturday, June 1, the Fiberarts Guild of Pittsburgh will present the Fiberart Forum. This day-long event will feature a keynote address by Jane Sauer and informal discussion groups with exhibiting artists. The day begins at Contemporary Craft and continues at the Brew House Association. Lunch and transportation between galleries are included. For more information about the Fiberart Forum and to purchase tickets, please visit: Fiberart Forum Registration. FI2019 exhibition catalogs will be available for sale at both exhibition locations. There will be two workshops taught by FI19 artists. Please follow the links to register. Intro to Sculptural Peyote with FI2019 exhibiting artist Beth Blankenship sponsored by Contemporary Craft. Add a new skill to your art practice toolbox. In this workshop, students will be introduced to a technique that will give their beadwork a new dimension. 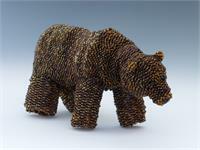 Sculptural peyote stitch uses just beads, thread, and tension to create 3-dimensional objects. 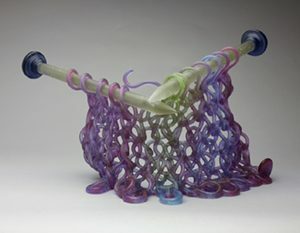 Knitting with Glass with FI2019 exhibiting artist Carol Milne sponsored by Touchstone Center for Crafts, 1hour from Pittsburgh in Farmington, PA. Combining her passion for knitting with her love for cast glass and sculpture, Carol is the lone pioneer in the field of knitted glass: creating knitted work in glass for over a decade.